Biopsy specimens are processed into formalin-fixed-paraffin-embedded (FFPE) blocks and currently, hematoxylin and eosin (H + E) stained sections are widely used for the histopathological diagnosis of cancer and other pathologies. Typically the sections are graded subjectively by eye, using disease-specific grading protocols. Histological grading of breast cancer currently varies widely across multiple institutions and practitioners, because it relies on subjective criteria. However an analysis of more than 24, 000 biopsies, graded by 732 breast cancer graders, found that they only agreed ~73% of the time on average. Image: New cutting edge technology can be used to grade cancer tumors, eradicating human subjectivity. 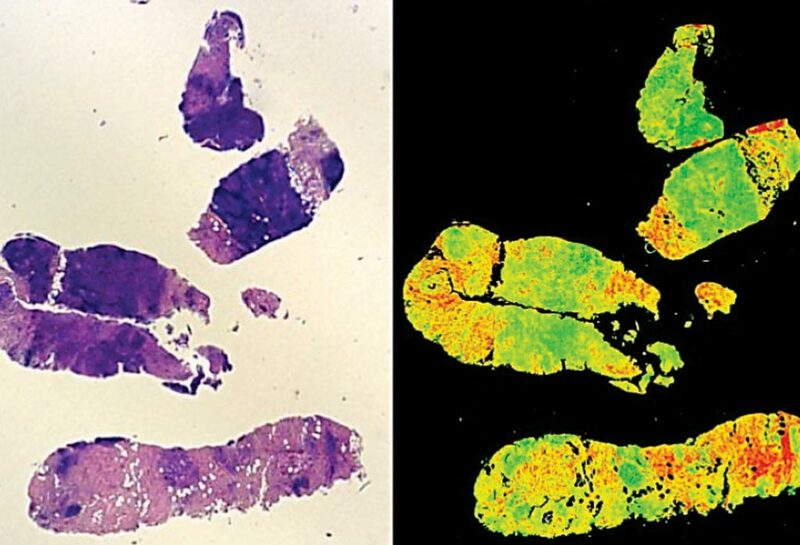 A traditional stained H+E biopsy (L) and a Digistain view (R) (Photo courtesy of Imperial College London). A team of scientists from Imperial College London (London, UK) carried out a double-blind clinical pilot trial using two adjacent slices taken from 75 breast cancer biopsies. The patients were all female with ages ranging from 30.4 to 83.7, mean age 58.7 at diagnosis. 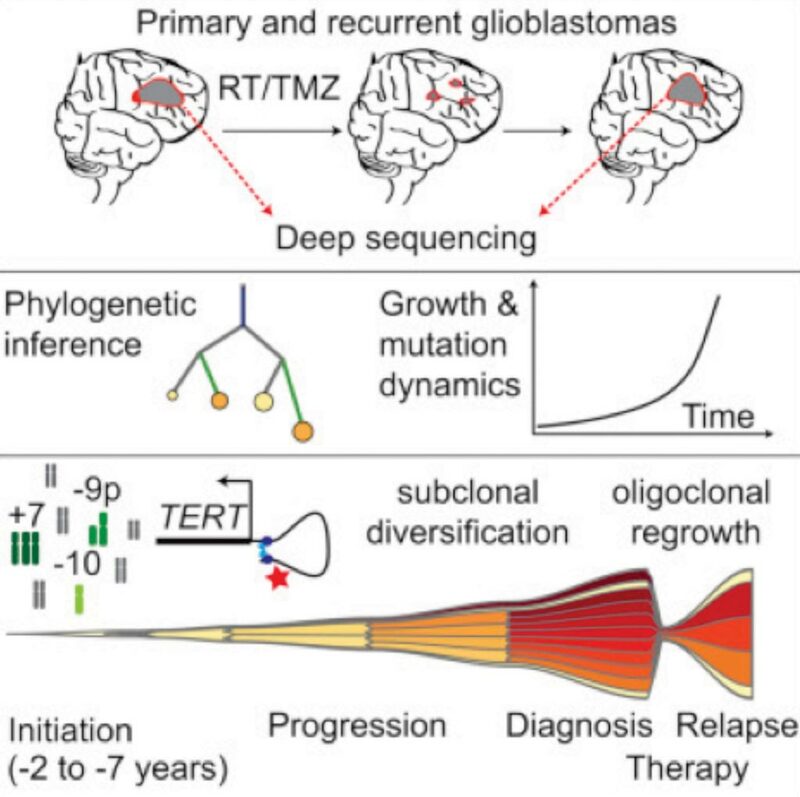 More than half of the samples were grade 2 tumors (54.3%). The majority were HER2 negative (90.0%). The first slice was graded by clinicians as usual, using the standard H+E protocol. It was also used to identify the so-called 'region of interest' (RoI), i.e. the part of the slice containing the tumor. The team used their new 'Digistain' technology addresses the problem of consensus among pathologists by using invisible mid-infrared light to photograph the tissue slices in a way that maps out the chemical changes that signal the onset of cancer. In particular, they measure the 'nuclear-to-cytoplasmic-ratio' (NCR): a recognized biological marker for a wide range of cancers. The team then used the Digistain imager to get a 'Digistain index' (DI) value averaged over the corresponding RoI on the other, unstained slice, and ran a statistical analysis on the results. The DI measures the concentration ratios of phosphodiester to amide moieties, and because these are dominantly related to the amounts of nuclear and cytoplasmic material, respectively, The DI images can be regarded as 2D maps of the nuclear-to-cytoplasmic ratio, (NCR). The NCR factor that ‘Digistain’ measures is known to be common to a wide range of cancers, as it occurs when the reproductive cell cycle gets disrupted in the tumor and cell nuclei get distorted with rogue DNA. It is likely that in the long run, Digistain could help with the diagnosis of all different types of cancer. At a practical level, the team reported that the Digistain imaging technology can easily and cheaply be incorporated into existing hospital laboratories, and be used by their staff. Chris Phillips, PhD, a Professor of Experimental Solid State Physics and lead investigator of the study, said, “Our machine gives a quantitative 'Digistain index' (DI) score, corresponding to the NCR, and this study shows that it is an extremely reliable indicator of the degree of progression of the disease. Because it is based on a physical measurement, rather than a human judgement, it promises to remove the element of chance in cancer diagnosis.” The study was published on March 13, 2018, in the journal Convergent Science Physical Oncology.